This classic calzone has it all — mushrooms, prosciutto, tomatoes, and mozzarella. You need 1 prepared recipe of Basic Pizza Dough. 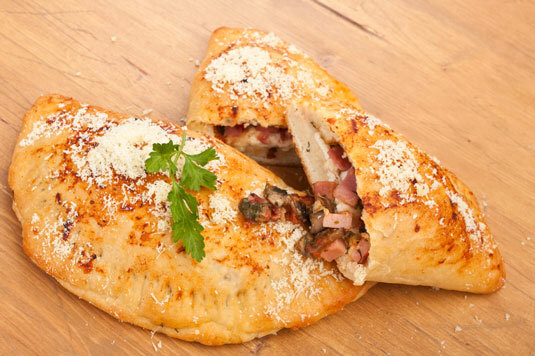 Calzone fillings are open to countless variations. Lightly oil 2 large baking sheets. Heat 2 tablespoons olive oil in a medium skillet over medium heat. Add the mushrooms and sauté, stirring often, until they’ve released their liquid and it has evaporated. Season the mushrooms with salt and pepper. Transfer the mushrooms to a medium bowl and let cool. Spread the flour on a flat surface. Press 1 of the balls of dough out to form an 8-inch circle. Transfer the dough to a prepared baking sheet, cover loosely, and set it aside. Repeat with the other 3 pieces of dough. Add the prosciutto, tomatoes, mozzarella cheese, and oregano to the bowl with the mushrooms. Season with salt and pepper and mix well. Spread a fourth of the filling on half of 1 dough circle, keeping it 1-1⁄2 to 2 inches from the edge. Fold the other side over the filling and pinch the edges together to form a seal. Repeat this procedure with the other 3 calzones. Using a fork, poke a few holes in the top of each calzone. Drizzle with the remaining 2 tablespoons olive oil.